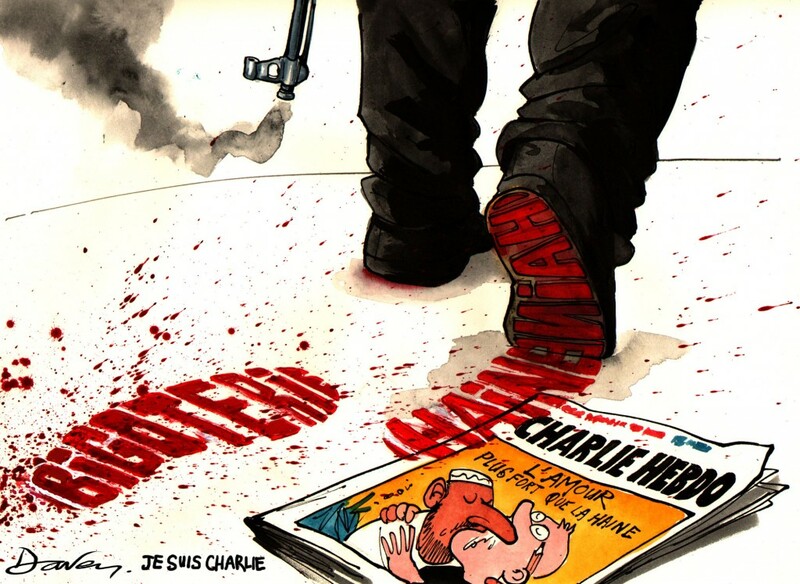 One year on from the Charlie Hebdo shootings, on the day when an anniversary edition of Charlie Hebdo appears on the newsstands with a cover depicting a “God” bearing bloody hands and a rifle, I feel like reflecting on what it all meant. I’m not sure the thoughts will be very coherent but here goes. I am a cartoonist, so the events of last January in Paris have a strong resonance for me, not least because I don’t want to be killed by terrorists. I guess I’m happy to say “Je suis Charlie” but I should probably also say rather weedily that “je ne suis pas un agent provocateur”. Charlie Hebdo cartoonists were and are brave for taking the strong position they have taken for many years on the hypocrisies of organised religion. I wouldn’t choose to deliberately provoke, like Charlie Hebdo does, but there is nothing wrong to my mind with the image as depicted on the cover of the current magazine. Drawn images are powerful things. This is a metaphor. The non-denominational God is presumably meant to represent religion generally. The point I take is that religious disharmony is still causing death. To depict a non-denominational God as a metaphor for bloody violence seems a pretty reasonable position to take since huge numbers of people have been slaughtered by angry men in his name over many centuries. However, many people will angrily assume it confirms their prejudices and say that “Charlie Hebdo is saying God carries a gun. How sacrilegious!” It is a picture. Not a bomb. It would be useful if everyone looked at it, thought about it and moved on. It would be nice to be able to draw what I want. However, I know that I have no absolute right to such freedoms. Rights are conferred by a society and often won through generations of struggle. And along with rights come responsibilities. In this case, that responsibility is to consider the readers’ genuine sensibilities. The point of political cartoons is, to borrow Finlay Peter Dunne’s journalistic adage , to “afflict the comfortable and comfort the afflicted”. Or, put differently, to show up hypocrisy and abuses of power by the powerful so as to provide some comfort, levity or perhaps an alternative viewpoint for those not in power. I don’t want to insult ordinary people for their personal beliefs, spiritual or secular. I have no brief to ridicule Christians, Muslims, Jews, Zoroastrians or atheists because of how they see the universe, as long as they profess tolerance and peace. But I would like to be able to point out the hypocrisies of organised religions and their entrenched hierarchies, especially if the power-brokers of those sects act irresponsibly or foster disharmony. In an Islamic context, I have no wish to mock The Prophet Mohammed but I do want to show up the evil perpetrated by certain misguided people calling themselves Muslims, in positions of power. And guns give you power, albeit local. I would also like to be able to softly point out the humour in belief itself. I see this as simply holding a mirror to ourselves as human beings. Most human activities reveal comical aspects when held up to close scrutiny. The problem of aniconism (banning the creation of images of gods and prophets as false idols) is real. Largely, since the Reformation, with a few wobbles, Christian society has accommodated it to the point where it is no longer a source of conflict. However, that is not the case in Islam where the ban extends widely – but variably – to the creation of images of any sentient living beings, with notable local exceptions. To the modern western mind, this sounds absurd in its wider form and questionable even in its restricted form. We live in western democracies. We should be able to speak freely and draw pictures freely. If it offends you, well, don’t look at it. Or turn the other cheek. It’s easy to be offended by all sorts of things in our world but it doesn’t mean that you have to kill someone for it. Killing people for drawing pictures is not part of any religious experience. It is simply the projection of someone’s anger through a prism of their warped belief on to a person armed with only a pen. The Pope is quoted in the Vatican daily, saying “If a good friend speaks badly of my mother, he can expect to get punched, and that’s normal. You cannot provoke, you cannot insult other people’s faith, you cannot mock it.” This is a hot-blooded angry man speaking, rather than a tolerant religious leader. It doesn’t help. Although they are rarely carried out, death threats are no new thing for political cartoonists. They come from various aggrieved sources. The thread that binds these people is not religion, but that they are, well, nutters. Anybody who seeks to kill another person because he (it is almost always “he”) dislikes something the other has written, spoken or drawn is a psychopath, regardless of whether it is dressed up as religion or not. These killers in Paris committed acts of evil, not redemption. The fact that terrorists are almost always male is crucial. The attraction of sophisticated weaponry to young men, whether it be real or virtual in computer games, is a commonplace. When these men are disaffected and dissatisfied with their lot to the point of social exclusion, and have access to weapons through criminal gangs or politico-religious zealots, the possibility of horrendous bloody crime increases. And the killing of the cartoonists should be put into context. In the same week as the Charlie Hebdo shootings, apparently up to 2000 people were murdered by self-proclaimed “Islamist” zealots in Baga, northern Nigeria. This was only briefly reported in the media. Many of the victims were Muslims. But more importantly, they were innocent people. Losing a regular cartoon slot got me doing some industrial scale panicking. Was it likely I’d be able to find a paid outlet for my political cartoons in a disappearing world of print? Or in the bright digital future? Panning out from my own tiny, irrelevant, personal maelstrom, was there any future in political cartoons? Well, I dunno, but I’m sure going to windbag for a bit about it. Images are powerful things. Incredibly powerful. I would beg to differ with Moses and his chums – with the humility befitting my trade, natch – in the beginning wasn’t the Word. There were millennia of visuals before words turned up. And they are embedded in our brains as tools of memory and imagination. They are powerful things. People who want to manipulate minds – advertisers, TV producers, politicians, street activists (e.g. Paris 1968) – know it. Artists and photographers know it. Heck, even cartoonists know it. Take this example from VE Day,1945 (scroll down), showing an embattled British soldier handing back the laurel of peace and victory to the reader, asking “victorious” Brits to recall what sacrifices had been made. It no doubt had an effect on the reader. But that Philip Zec cartoon is unusual as a political cartoon. It shows no politician. They are usually the players who act out the farce in political cartoons. 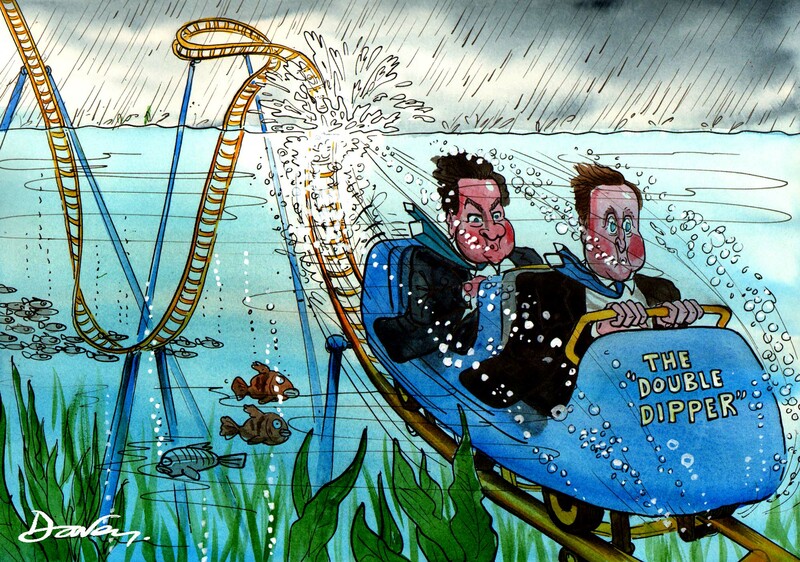 The aim of a political cartoon is usually satirical, using comedy or tragedy. Many combine both, like this one from 2003, when Iraq was about to suffer “shock and awe” at the hands of Bush and Blair. The situation was tragic but it attempted to use black humour to make a point. But more generally, what is the point? Surely just like the best journalism, it is to satisfy the creaky, overused old Quaker saw “Speak Truth to Power”. To show up corruption and hypocrisy in those in power. How much of an effect they have is an open question. The late Alan Coren, the last great editor of the British satirical magazine Punch, had a lot of respect for the form. He knew that cartoonists didn’t bring down governments but he also knew they had power, saying “They’re the picture that tells the thousand words of crap journalism that’s framed around it”. And that from a writer, not a cartoonist. He was being impish; he didn’t mean to disparage journalists by saying that – but he was highlighting that journalists are often paid by the word whereas cartoonists are paid to condense an idea into a single image. So it may be so that cartoons don’t actually bring down governments – certainly not in the UK. But the important thing that they do – like all images – is to leave a mark on the subconscious. And the subconscious is a very powerful thing. What’s more, cartoonists tend to get away with more than writers – because they use images which suggest “what if” rather than stating things in words which can be refuted. You only have to look at footage of demonstrations in places where the written word is an act of sedition and see how banners carried by demonstrators use cartoons – or crude caricatures – to make their point. But cartooning in such places is nevertheless a dangerous occupation. Cartoons frighten autocracies because of their power. It’s also true that in many of these countries people value their cartoonists because they convey ideas strongly and simply without literal libel. The Al-Jazeera news channel recently devoted a full 45 minutes to the power of the editorial cartoon, with extensive interviews of cartoonists from Brazil, Sudan and Malaysia. Their stories were enlightening and humbling. They had all been threatened by authorities or religious groups. None of them could publish freely in mainstream media in their countries. But they each spoke proudly about their cartoons being used by political activists to spread messages. In the established democracies, governments don’t tend to arrest or even sue cartoonists. Primarily, this is because it would make a laughing stock of any government which did so. But also because any shocking, controversial stuff is removed by editors before publication. However, the images which are published still exert a slow-burning subconscious effect. This is nothing new. There is a very long history of excellent political cartooning in this country – by turns scurrilous, adolescent, pompous, scatological, conservative, radical, preachy, dull, shocking, outrageous, hilarious, impenetrable and sublime – going back to the Georgian period. “Oh, do show us an adolescent, scatological one”, you plead? 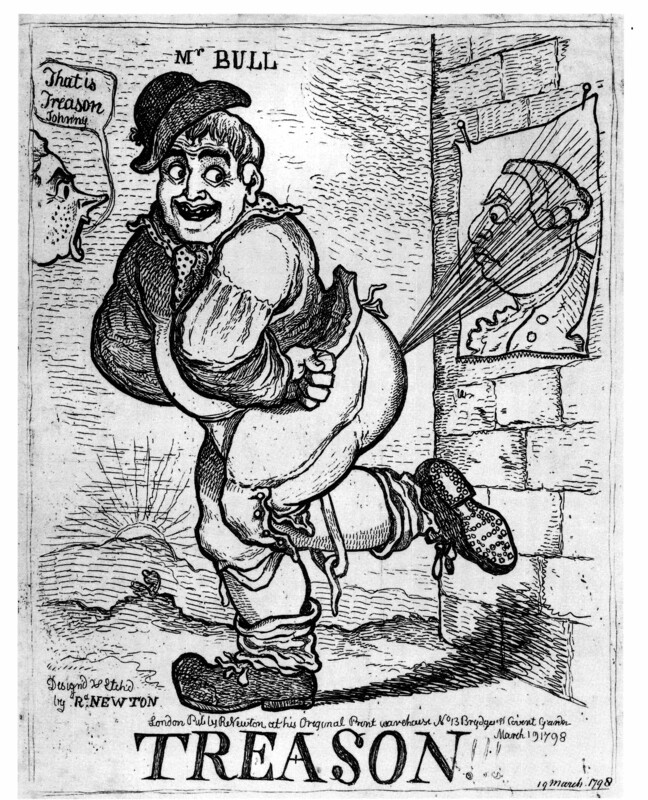 Oh, OK then, here’s one from Richard Newton, a cartoonist who died at the age of 21 in 1798, but not before producing a series of hard hitting, graphic images, often rather adolescent, like this one of John Bull triumphantly farting in the face of the king, George lll. Oooer! Satire! A similar image today would still be quite shocking, if a tad on the tasteless side, and certainly wouldn’t appear in mainstream media. A somewhat shocking image from 1798 - John Bull paying his disrespects to King George lll. Cartoons had popular power then, even the ones without farting. People would flock to print shops to see the latest cartoons and debate them. So much so that it is often referred to as the golden period of caricature. 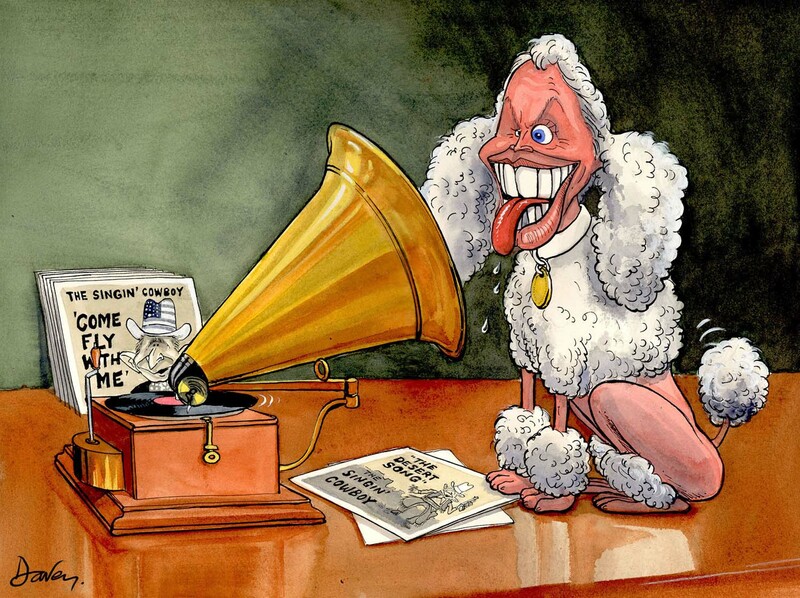 Ever since Gerald Scarfe’s sublime caricature skills first graced the media in the 1960s, reflecting a new irreverent age, we’ve probably been in another golden period. The likes of Steve Bell and Martin Rowson at The Guardian, Dave Brown at The Independent, Peter Brookes and Morten Morland at The Times and Christian Adams at the Daily Telegraph all draw potent images daily. So there is a roster of excellent cartoonists working in the UK today, still using to good effect the old tricks employed by Gillray’s contemporaries – metaphor, allegory, hijacking popular art forms, pastiche and good old toilet humour. However, this excellence is no guarantee of the longevity of the art form. 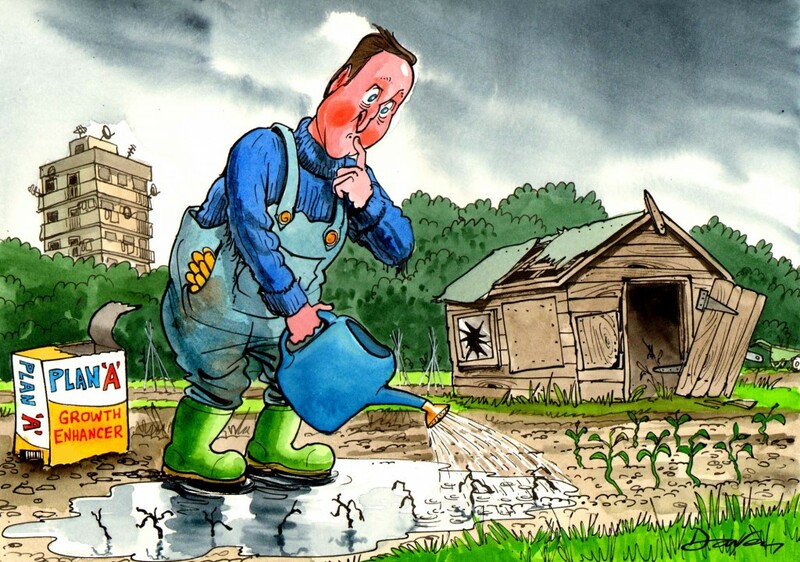 Martin Rowson rightly says we cartoonists are parasites who need a host to survive. We can’t survive on our own so well. In Gillray’s day, the host was the coffee house. Then we moved on to satirical magazines like Punch, then on to newspapers; perfect partners in the early days because papers were dry news sheets consisting of pages of uninterrupted type. That has become less true now that papers are full of colour photos of semi-naked celebs and huge ads all vying for the reader’s attention. In that context, The Sun’s decision to cut editorial cartoons from the paper last October wasn’t really a surprise. Presumably they thought that cartoons did not fit the new digital age. This culling is not limited to the Sun or the red tops – various cartoon slots have been cut from newspapers like The Independent, The Observer, The Sunday Times and more. Others have gone further and, like The Sun, ditched editorial cartoons too – The Evening Standard and the Mirror, for example. So we parasites are losing our hosts. Of course, job-wise, the same is true of journalists and photographers too, so I’m not pleading a special case for us cartoonists. I’m asking if this loss is a backward step for satire and even for the health of national debate. Well, maybe. Maybe not. But the following three points might be pertinent. First, the control some editors and proprietors exert over content stifles the cartoonists’ ability to satirise. When the business interests of a proprietor are reflected in the editorial stance of a newspaper, any genuine satire within that paper is dead. Second, perhaps is a too cosy relationship between power and the satirist. It’s a well known fact that politicians buy our cartoons to hang in their own toilets, use our images for their Christmas cards and present awards in a charming ironic, self-deprecating way to us at cartoon awards events. Third, are political cartoons, obsessed as they are with the soap operas of the Westminster Village, directed at the right power brokers these days? To a large extent, our laws and our fortunes are now set by supra-national organisations like the EU, World Bank, IMF and the World Trade organisation. But who are the faces of these organisations? Not ones the general reader knows well, for sure. The rightward shift and the squashing of the spectrum of political debate in Westminster and the western world over the last twenty years has made the debate less relevant and politicians less able to effect real change in people’s lives. I am not stretching caricature too far, I suggest, by saying that politicians have become puppets in the power play of larger puppet masters who direct policy either by direct lobbying or through constant nagging in the media. Politicians are on the stage passing laws – and therefore visible – but they don’t control the strings. They have been bypassed at the top by global interests and from underneath by popular movements like Twitter and 38 Degrees. The real power brokers sit inside global corporations like banks, credit rating agencies, trade organisations and the very media organisations who own the papers. These people are not getting sufficient focus in the traditional media. Who knows the faces behind the WTO, the IMF, the World Bank, the EU, the global banks and credit rating agencies? And who knows exactly how they exert influence? Far too few people, I suggest. We need journalists, unfettered by editors, to dig around and shine a light on these power brokers and their shenanigans. Once illuminated, cartoonists can do what they’re best at – colouring them in. So perhaps it would be best if political cartoonists were to divorce from newspapers and become more radical, more angry, using digital media. Well, “du-uh!” – it’s already happening, of course. Those cartoonists from the Al-Jazeera programme all published on the web, rather than via traditional media and none was paid for his efforts. And anyway, how relevant is a corpulent, well-paid satirist in the days of Occupy and the anti-global movements? The digital media are obviously the future hosts for us parasites. But the news gathering experience is very different on digital devices. As Peter Preston, ex editor of the Guardian said recently …”The internet doesn’t appear to know what to do with the visuals that suit newspapers best…this is the curse for cartoonists. [On the web], the images don’t dominate, but are politely filed away” You have to click on a link to find a cartoon. Or subscribe to it on a syndication site. With the loss of the old common debating room – national newspapers, radio stations and TV channels – the national debate is fractured into a million little blogs, images and tweets. We no longer get information and comment from the same few sources. A good thing perhaps, but the really important thing about the most influential political cartoons is that they are read by the general public, by “opinion formers” and by politicians – and maybe even discussed on news programmes. Once the cartoon is consigned to an obscure syndication site on the internet behind a few clicks, cartoons will surely become nerds-only curiosities like jazz or stamp collecting. The drawn image can be very powerful and direct, whatever the medium. 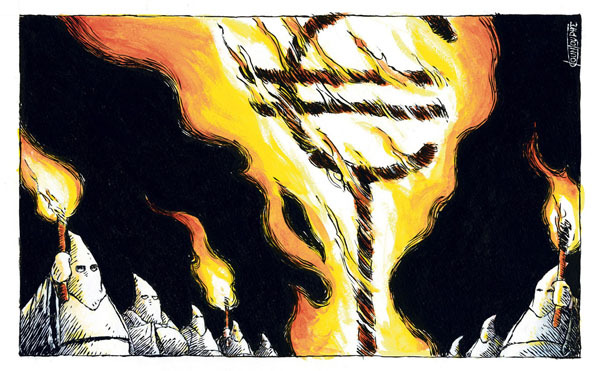 Many cartoonists would gladly draw more radical images, were it not for editorial intervention or for the lack of a funded platform to shout from. The message wants to get out but the medium is compromised. Sage, tech-guru and, virtual-reality inventor and fruitcake, Jaron Lanier, in his book “Who owns the future?” questions whether we are currently simply replacing old corporate media conglomerates with new ones like Google and Facebook. Lanier proposes setting up a “humanistic information economy” in which all “creators” are paid for everything they contribute online – if it ends up being useful to other people. Sounds rather good. But how could this come about without the cash-mountains available to global media outfits? How long would it take? I’ll be outside, holding my breath. The digiverse looks hugely exciting. But to bring our work to a digital public, we cartoonists need the collaboration of journalists. We work best together. And I would suggest, humbly, that we can help them in getting the message of Truth across to Power. If we can find a way of funding it. And so to the Political Cartoon Society’s annual cartoon awards bash at the old home of the Tory party on Smith Square. It’s now occupied by a smart PR outfit. Erm…no change, then. Most of the Tories have long gone, following their own recessionary we’re-all-in-this-together mantra and downsizing to small flat in Harpenden. One or two remained last night, not least the re-born post-plebgate Andrew Mitchell who bravely presented the prizes. Oh all right, here’s the reason I’m writing this blog. I can’t pretend otherwise. I won a prize. This may not sound like much, but it’s the only one I’ve ever won for political cartooning, so I’m going to milk it. OK, it was only the runner-up prize – the so called Tenniel tankard – but a prize is a prize. And if you’re going to be a runner-up, it may as well be to the inestimable Steve Bell. Steve has won more of these than he has had hot dinners [of which, he has also had a few]. And if it’s going to be a Bell cartoon, it may as well be a momentous one addressing the death of Maggie Thatcher. In a state of mild shock, I managed to cobble together a few words in grateful acceptance, musing that, as I had just been sacked/fired/dropped by Murdoch’s Sun and was therefore currently not a functioning editorial cartoonist and had never won a prize whilst being an employed one, the voters who marked an x against my cartoon were either grand masters of paradox and irony or were a bunch of complete schadenfreude-filled…well, bastards. Morten Morland, Nordic genius and all round nice fellow, deservedly won the Cartoonist of the Year award again. I once bemoaned the fact that it was pointless to enter these competitions because the same old people (Steve Bell and Martin Rowson of The Guardian, Dave Brown of The Independent and Peter Brookes and Morten Morland of The Times) won every year. I was rightly reminded what a thankless oaf I was by the organiser and head honcho of the Political Cartoon Society, Tim Benson. He said that (a) I was a fool for entering such a stupid “career” where there are only half a dozen or so full-time jobs available and (b) I was competing in a field of geniuses, so was bound to feel a failure. Of course, he was right. The above-mentioned fellows are indeed all geniuses of their field and I pay a quiet internal hommage every time I see their work. So it was especially nice to be awarded amidst this hallowed company, if only inna-Buggins-stylee. warming to bathe for a few moments in the feeling that political cartooning is still important, still vibrant. I say that because the outlook is not immediately rosy for us scribblers. If you want to bore yourself to sleep, here is a fuller account of woe. The ever-eloquent Rowson always likens us to parasites who will find a host even in the most unforgiving of environments. Our forbears were hosted by Georgian coffee shops, pompous, dry Victorian magazines and eventually newspapers. The latter have always been compromising hosts for satirists, being mostly owned by overbearing right-wing free-market Zealots With Opinions. So, after the death of print, I’m sure the digital world will eventually find a way of funding the luxurious debauched life-style of the satirical scribbler but it may not be for a long time, given the current reluctance of anyone to pay for “content” online and the consequent wholesale loss of income for journalists, writers, photographers and cartoonists. Asked about the outlook for the art form in a New Statesman article earlier this year, I suggested that “Its future may well be as a radical but unpaid version on the web”. In a sense, that is very exciting…liberating. The problem for the scribbler is putting food on the table while being an oh-so-radical web cartoonist. Maybe ‘twas ever thus and should be so. There is something unattractive, uneasy, about the corpulent satirist. There’s no shortage of talent around – viz the above mentioned geniuses together with a younger crop including Ben Jennings, Bob Moran, Rob Murray and others. 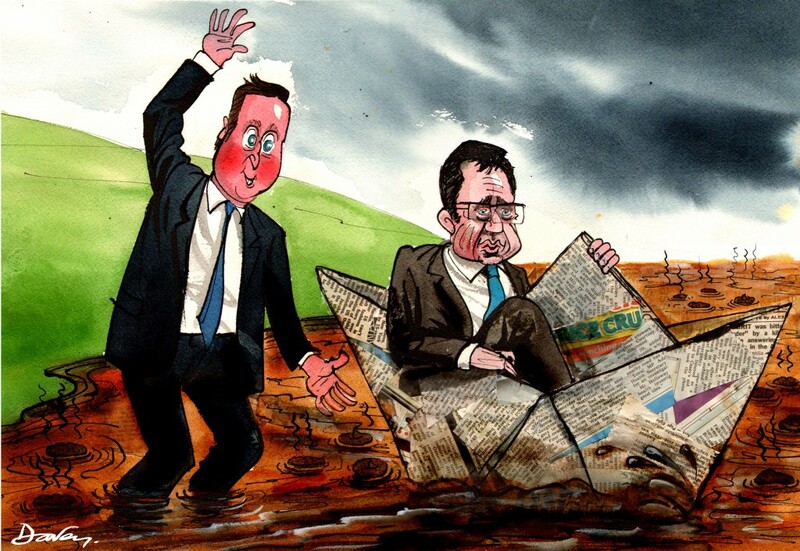 And political cartooning in Britain is probably healthier and ruder than in many other comparable societies. So long may the scurrilous art form flourish. Oh, and the esteemed Dr Benson would not forgive me if I forgot to big-up his nice new shiny book. 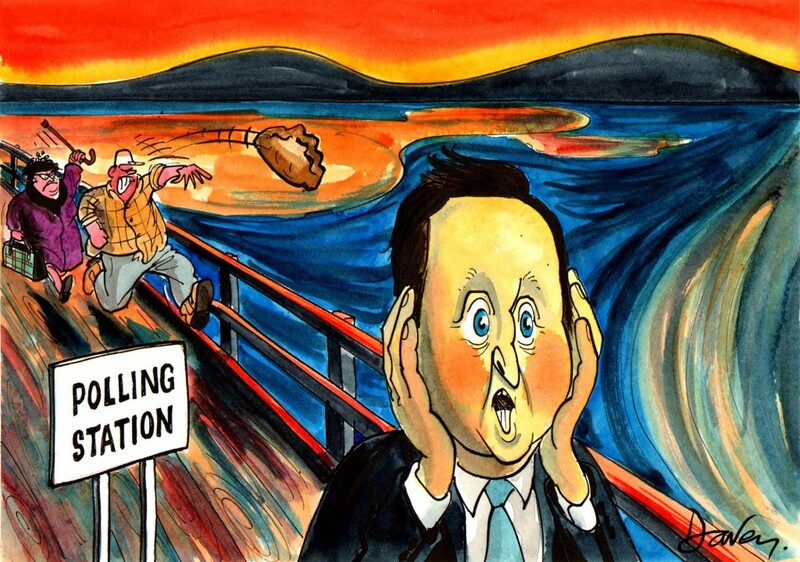 It’s called “Best of Britain’s Political Cartoons 2013”. You can buy it here. Er, and did I say it contains some of mine? It really would make a perfect stocking filler for the cartoon nerd in your life with lumpy, angular legs. The news that the UK economy shrank last quarter faster than previously estimated was surely no great shock to anyone but those jolly Bullingdon Boys. Dave’s message has shifted subtly from “austerity is good for you” to “austerity is good while we think up a new story – hang on in there…”. Growth is the new thing doncha know. But the growth needs to start elsewhere. Dave’n’George have decided that since the public no longer laps up the notion that the current global downturn is all the fault of Gordon Brown, they’d better cast around for a new narrative. That’s what PR types are good at after all. 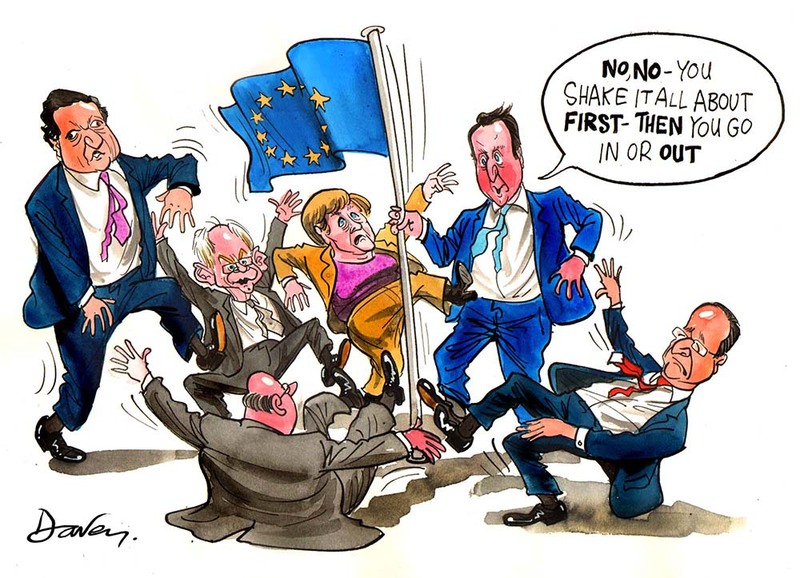 Enter, evil Baron Eurozone, stage right, twirling his moustaches in a very theatrical untrustworthy Frenchy fashion. Despite the fact that the eurozone shrank less than the UK economy last quarter, the economies of the rest of Europe are the source of our current malaise. So they should jolly well roll up their sleeves and do a bit of growth stuff over there. Austerity is good for you Brits but it’s dashed poor show on the Continent. So Dave continues to push the line that Plan A is essential and that growth is just around the corner. The cartoon was drawn for The Sun, but was not published. Reports back from Bond-style commando journos who have spied inside the command HQ cave, deep in a mountain inside the…er…Reichstag say that the first signals of Greece’s release from the chains of the euro have been seen. Is this a Good Thing? Or a Bad Thing? Hard to say for mortals whose only access to macroeconomic wisdom is the confusing array of articles in the media. If you like the Mail, you won’t care if Greece stays or goes, but you’ll be worried about the “frightening £120billion (and that’s excluding the tens of billions we’ve pledged through the IMF)” made up by some sharp young suits at “the Eurosceptic Bruges Group” which will be demanded by the Eurozone to patch it all up. This is because “as this paper has argued for more than a decade, membership of the single currency is simply incompatible with democracy and the nation state”. 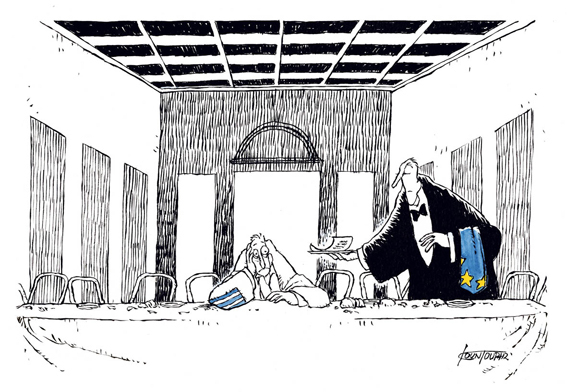 So if you believe in democracy, those Greeks have gotta go. If you’re a Sun reader, you’ll also be worried about that £120bn predicted by “experts”, but strangely, you’ll also be concerned about the FTSE 100’s dive, “knocking £28.5billion off the value of Britain’s biggest companies”. Like all Sun readers, you’ll be hooked on the progress of the FTSE due to your long holdings in British blue-riband stock. The editorial also calms nerves everywhere by reporting fears of civil war in Greece. Never mind though, George Osborne displays the wisdom of Solomon, hitting back at nasty Socialist anti-austerity campaigners such as M. Hollande. You see, it’s “uncertainty not austerity” which has caused the growth crisis across Europe; “wobbling” was doing “real damage”. This terrifying death-wobble will “probably usher in left-wingers who would reject Greece’s £105billion bailout deal — leading to a return to the drachma”. Similarly, the world must wait for The Telegraph to deliberate on whether Greece should stay or go, but the old grump administers a traditional tough-love smack to those naughty children of Southern Europe where “the public mood is growing hostile to the austere economic measures necessitated by their own profligacy and levels of indebtedness” [trans: “You’ve not only let yourself down but you’ve let the whole of Europe down, imperiling your Daddy’s nice little nest-egg”]. The Torygraph also manages to contort history like a magician’s modelling balloon by awarding the kudos for staying out of the euro to the Tories, who were…er…out of power at its inception when Gordon Brown insisted on staying out as a condition of remaining chancellor. The Independent tries to live up to its name by comforting us with the simple statement that “the world braces itself for” the Greek exit. Hang on though, school clever-clogs Dominic Lawson has burst into the common room, telling everyone he knew the whole thing would end in disaster, because Daddy told him so. And it’s all those dreadful Germans’ fault anyway. And to support this view, he drags out a quote form that dear old balanced centrist, Milton Friedman, architect of Reaganomics and father of banking deregulation, as dictated to Daddy and Auntie Margaret. Despite wall-to-wall coverage, it’s no clearer over at The Grauniad. 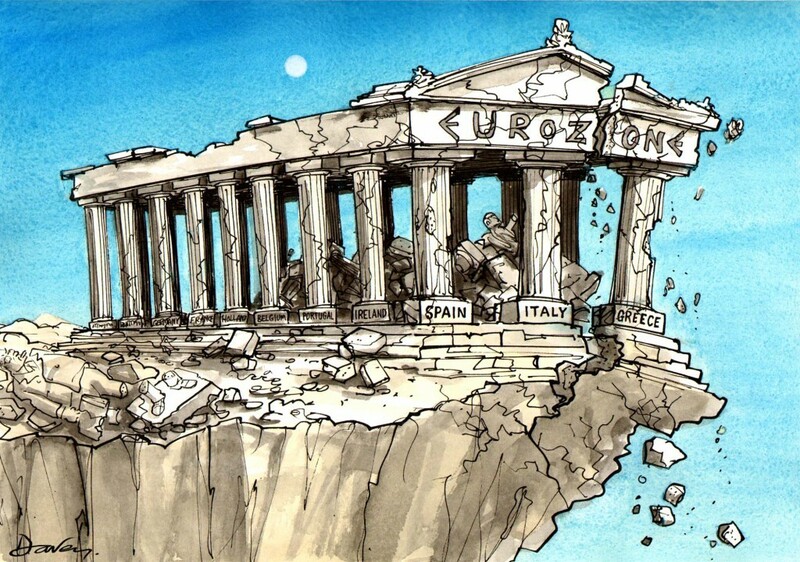 The front page screamed that “Europe’s elite was braced for” Greece’s exit. The rest of us proles presumably look on, bemused like mediaeval comet gazers, watching the pretty, sparkly glow of doom as it approaches. I hope that’s all clear then. In short, you pays your money – but probably not in euros – and you takes your choice. As you can see from my pathetically non-judgmental Sun cartoon above, I’m as confused as you. Donations please to my think-tank, the International Forum for Macro-Economic Confusion. Thanks. Top Greek cartoonist and all round good egg Michael Kountouris kindly agreed to write a short series of blog articles (translated by his wife, Athena) for www.procartoonists.org (@procartoonists) about the situation in his country following the economic crisis. His moving illustrated accounts can be seen here and here. Michael is a sensitive, passionate observer of the situation enveloping his country and he writes movingly of the reality of the situation which is all too often presented in the UK media as just another bunch of lazy southern Europeans who can’t balance a budget; like he says “The saddest thing is that we also discover that our country has been vilified all over the world.” Kountouris is one of the very best political cartoonists in Europe; he uses metaphor with the ease of a poet and has a pocketful of international prizes to prove it, although that must be little comfort right now. Michael writes “Greeks are facing a daily attack on their incomes, their rights, their freedom, hope, culture, their dignity and honour.” What he doesn’t mention is that he lost his job at a prestigious Greek newspaper last year because of the austerity cuts. That’s in-yer-face reality. In terms of impact in the newspaper, it is like The Times pensioning off Peter Brookes or The Guardian axing Steve Bell because such off-message comment is seen to be a luxury in straitened times; a convenient excuse for newspapers owned – as Michael points out – by “big companies, building contractors and ship-owners” who don’t serve the people’s interests. I’ve attached just two of his cartoons here relating to the crisis, but please check out his www.procartoonists.org pieces and his website. As if anyone should care, I rather pompously vowed years ago never to draw a pastiche of The Scream as it had been so overused as everyone’s go-to image for the modern condition of alienation. But hey! What are rules and resolutions for? Yessir, that’s right; stick it in Friday’s post-election results paper, please. After all, it isn’t that often that one of Munch’s original versions is sold…and in a week where the governing party gets decimated in local elections. The people have spoken, mostly to say “nah, I’ll just stay here on the sofa, thanks” but also to deliver the message that the granny and pasty taxes were two steps too far in the march to austerity – “keep in line you poor people at the back!”. George Osborne was wheeled out today to be seen eating a thin slice of humble pie (with nice full fat rich gravy) on TV with Mr Marr. You know the routine – concerned downward glances, pensive chin rubbing and “take it on the chin…learn from what you are saying” and the like. But then the old mantras bubbled out like a melt-water spring “…no alternative but to carry on… clear up the mess… focus on what matters… get the deficit under control”. That’s ma boy. That’s the Bullingdon Gideon we’ve come to love. However, may the mood muzak be changing subtly in the background? No mention of being all in it together was heard. And big talk of getting the economy growing again and infrastructure projects moving again. Is this a faint herald of a Keynesian plan B on the horizon? Nah, surely not. There’s been much talk of political “firewalls” recently. Little Adam Smith was Culture Sec Jeremy Hunt’s firewall, although he proved to be expendable. Jeremy is doubtless now feeling the heat of the inferno surrounding his house of cards. He is supposedly Cameron’s firewall in the BSkyB takeover affair. He’s still there as I write, but Call-Me-Dave’s had firewalls before. And they were cast asunder with some haste. Who, you ask? Why dear old Andy Coulson, natch. What’s that? – “do I have an old cartoon which might illustrate how Cameron is happy to ditch his firewalls and apologists once they become besmirched, in a furiously mixed metaphors kind of way?” Well, I do as it happens. Not so much firewall, more floater. Wait – I’ll dig it out. Here it is, entirely gratuitously published for the first time. It had been languishing in my private vault. Strange old week innit. 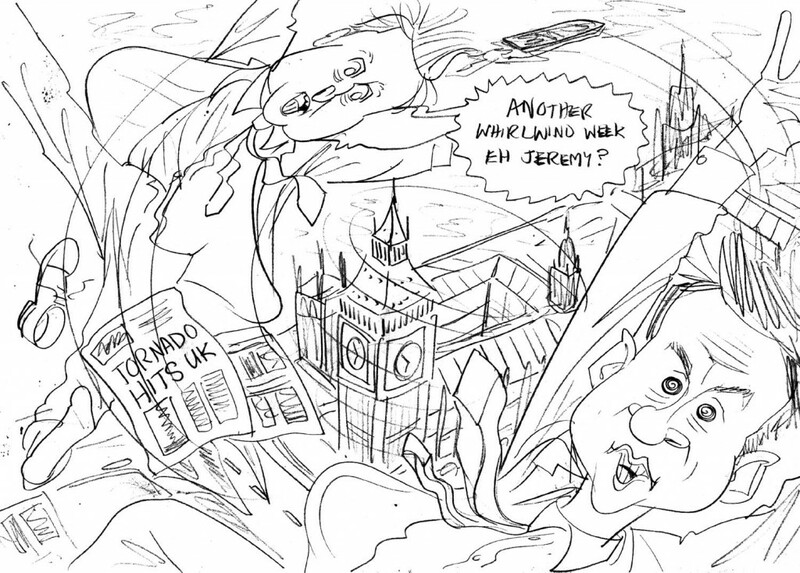 Wind, rain, double dip recession and Levesonian intrigue combined to make things a little turbulent all round; ideal for an editorial cartoonist, you might think. And you’d be right. I managed to combine two of those stories into the above cartoon. But the Leveson Inquiry is a little more problematic to portray in News International newspapers since they are at the eye of the storm. However, the story broke out of newspaperland and ran amok in the Palace of Westminster, taking on a life of its own on Thursday when Jeremy Hunt fired Adam, his little SPAD gofer, possibly breaking ministerial code in doing so (yet to be tested). This story could be presented without mention of newspaper proprietorship and I thought I had managed to get a cartoon on the subject through on Thursday when I submitted a rough (below) combining the raging tornadoes and events at Westminster. All OK until the last minute when I was told that Cornish pasties should take centre stage in the editorial cartoon instead of Hunt’s Hubris. Ho hum. Here’s the poor old spiked rough anyway. I’d smugly ask visitors to quietly admire the impressive perspectival foreshortening before leaving a fiver in the box. Thank you.